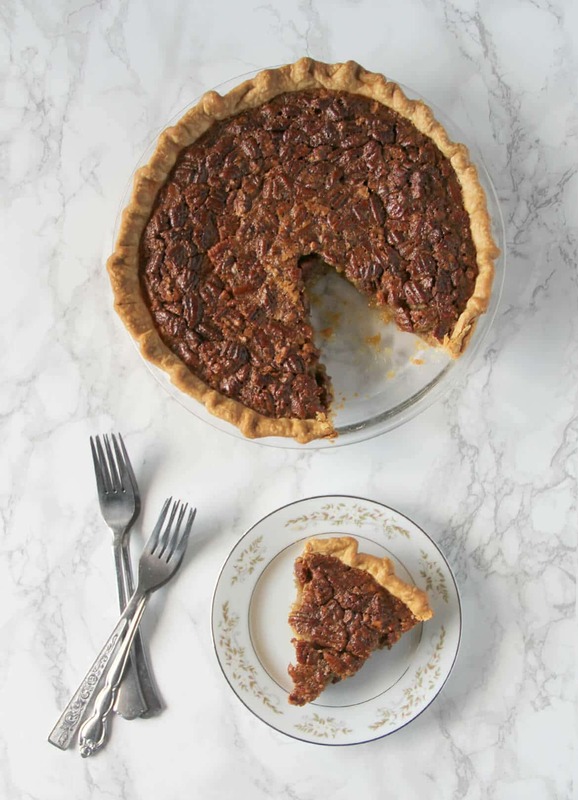 This Southern Pecan Pie recipe is a classic but swaps old-fashioned cane syrup for some of the corn syrup. The result is intense and delicious flavor, not just overwhelming sweetness! **Note: Recipe updated November 25, 2016. They dot the landscape of Middle and South Georgia…tall, majestic trees offering shade beside homes or towering together in groves alongside country roads. In the fall, they drop their crunchy, meaty bounty right onto the ground. In days long gone, all those ripe pecans had to be hand picked and tossed into large burlap bags. 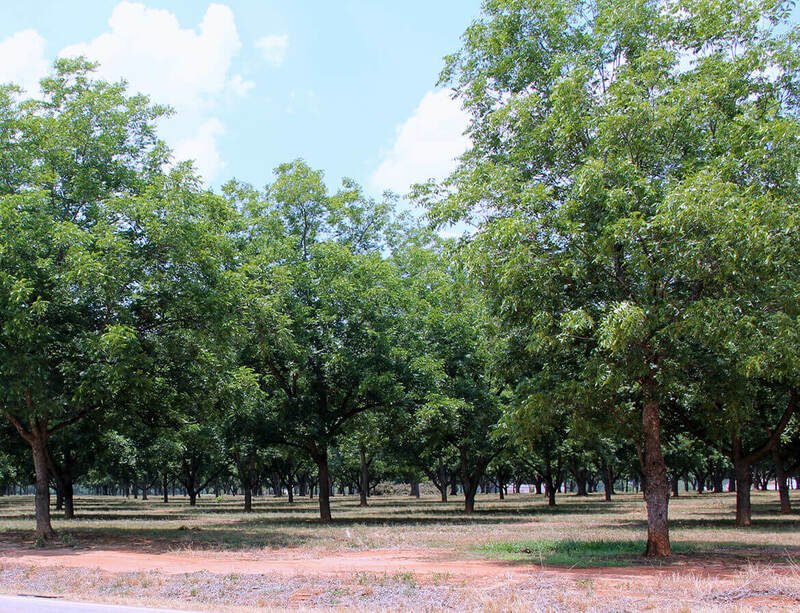 Now, of course, there are machines to do most of the work: shake the trees and gather the pecans, then take them to be cracked, packed and sold. 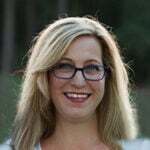 When I was growing up, we were of the burlap sack or five gallon bucket mode. A large pecan tree graced our front yard, which provided ample shade over our trampoline and was enjoyed quite well until harvest time. Then Mama would send us out to gather pecans and I promise you’ve never had a more boring, tedious, back-breaking job than gathering pecans. Unless it’s shelling the pecans. Or shucking corn. But I digress. Sometimes my mother would be especially mad at my sister and me and would decide that the lone tree in our yard would not suffice for punishment; we would then travel to a friend’s pecan ORCHARD, where there would be multiple trees—and we would wander in this lonely place for hours, picking up pecans and grumbling all the way. Never tell your parents you are bored if you live in the country. Trust me. Most of the pecans we gathered were shelled and frozen for future use, although a good bit were roasted immediately, tossed with a little salt and kept close by for snacking. And of course, at every church gathering and on every Thanksgiving and Christmas table was a pecan pie, in addition to apple pie, sweet potato pie, sweet potato casserole, pumpkin pie, caramel cake, chocolate cake, and sometimes, fried pies. We never lacked for desserts anywhere! 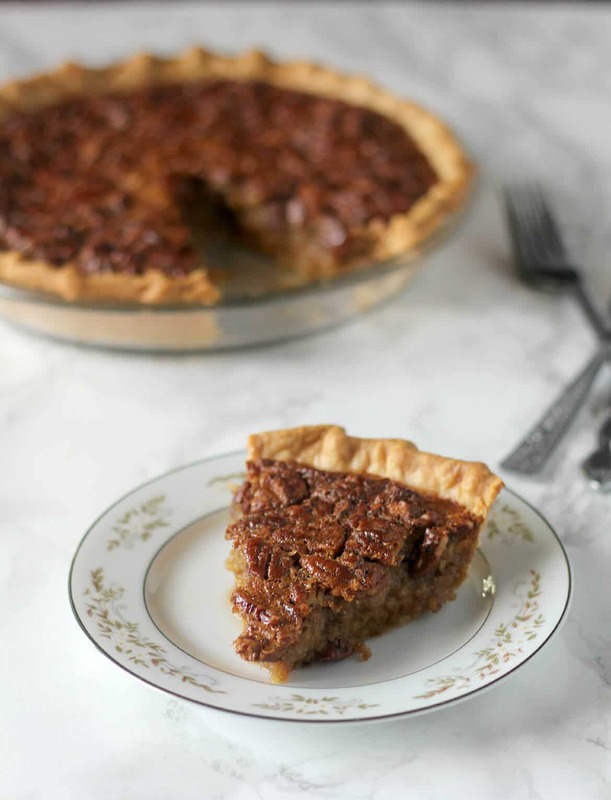 Southern Pecan Pie is one of the easiest desserts you’ll ever make. 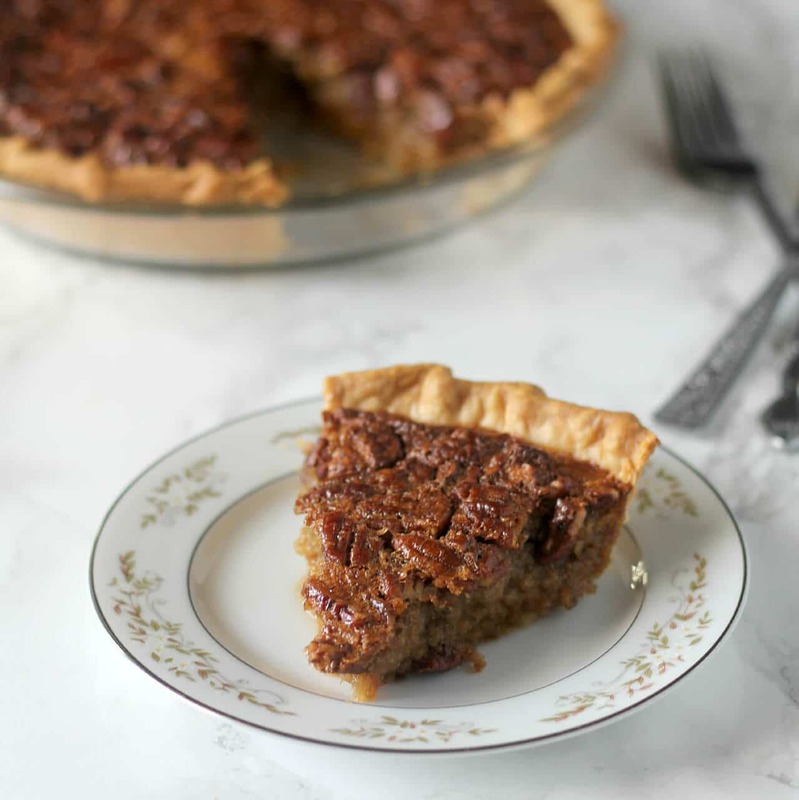 You can find recipes that try to fancy it up and make it complicated, but the fact is, a good pecan pie takes less than fifteen minutes to throw together and then is good for several days. 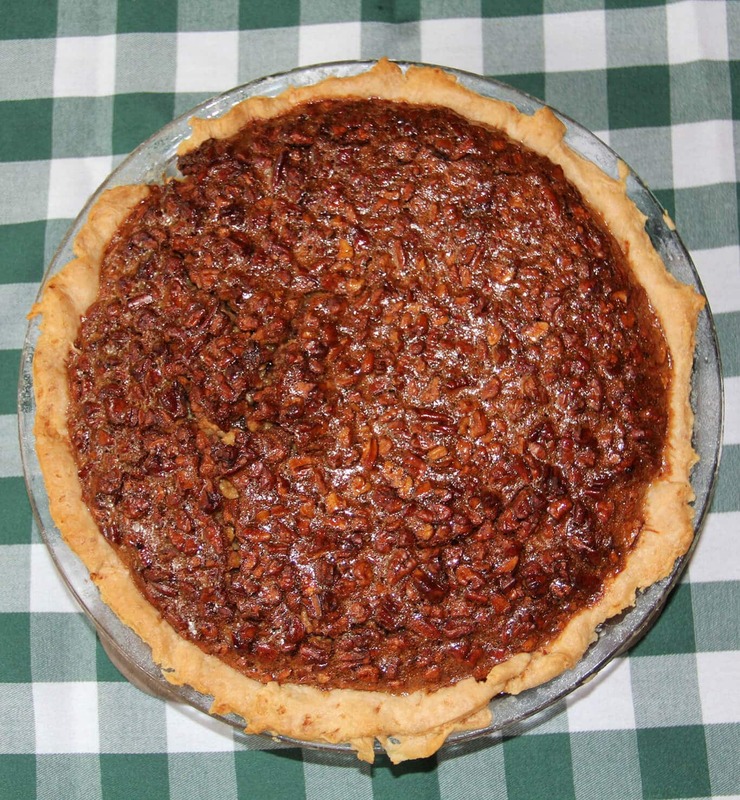 I like to use cane syrup in addition to the regular corn syrup because I think it adds more flavor, and I also roast the pecans before adding to the pie. Start with a couple of handfuls of pecans and spread them out on a cookie sheet. Heat the oven to 375° and then toast the nuts for 8-10 minutes. While the pecans are in the oven, you can get the rest of the ingredients ready. 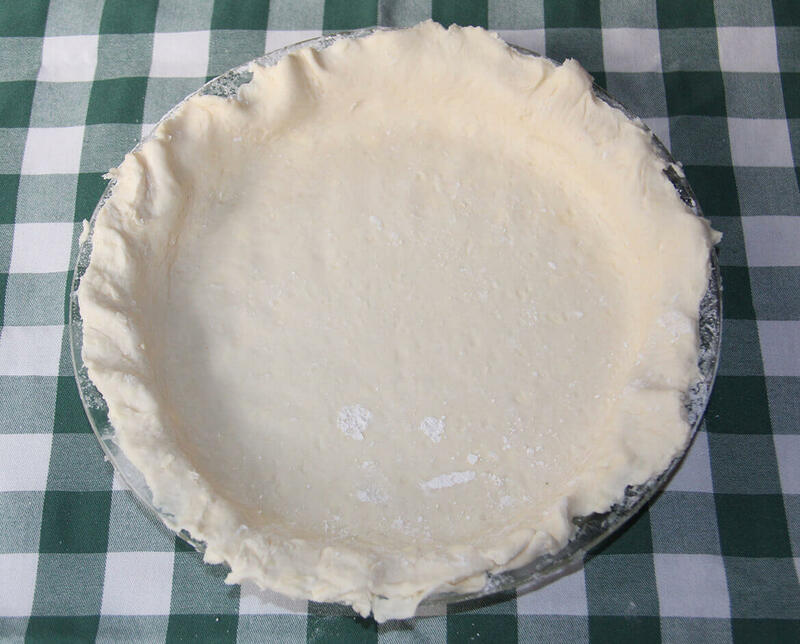 You’ll need a 9-inch (not deep dish) pie crust, and my pie crust recipe is easy if you’d like to try making homemade. Melt 4 tablespoons unsalted butter. In a large bowl, combine 1/3 cup light brown sugar and 1/3 cup white granulated sugar with 4 eggs and whisk together until smooth. Whisk in one tablespoon of flour. Pour in the melted butter, 2 teaspoons vanilla extract and 1/4 teaspoon salt. In a 1 cup measuring cup, add 1 tablespoon molasses and then fill the cup with cane syrup until it reaches 1/2 cup, then regular corn syrup to 1 cup. Add this to the egg mixture. 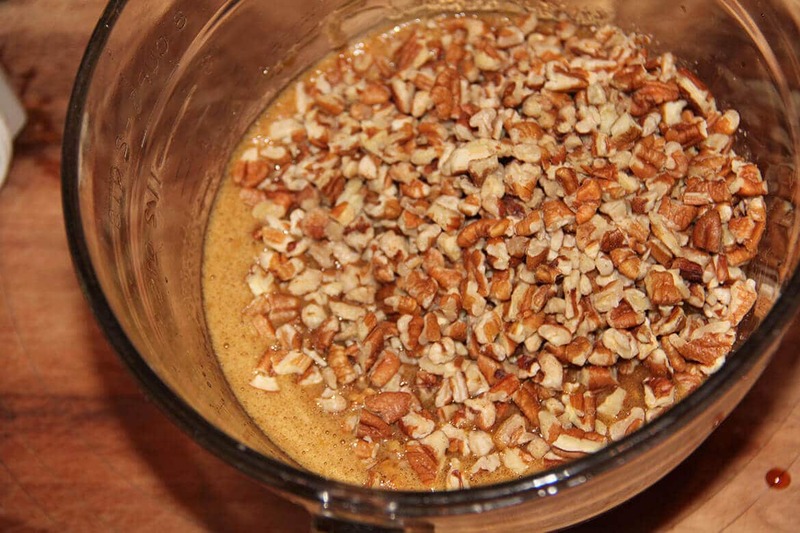 Coarsely chop the toasted pecans and add 1 1/2 cups to the syrup mixture and stir until all the pecan pieces are well coated. Then pour it all into the pie crust and place the pecan pie on a large cookie sheet. Bake at 350° for about 50 minutes, until the pie is just slightly jiggly in the middle. Remove and let sit at least an hour before serving. 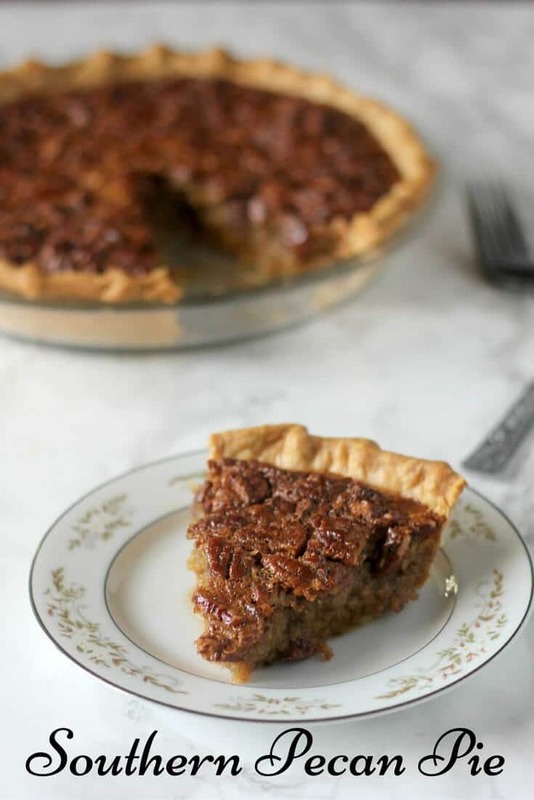 Good, old-fashioned Southern pecan pie—a perfect Sunday afternoon treat with a cup of coffee. Preheat oven to 350. Spread pecans on a large cookie sheet and roast for 8-10 minutes. Allow pecans to cool slightly then coarsely chop. In large bowl, whisk sugars and eggs until smooth. Whisk in flour. Add melted butter, vanilla and salt and whisk together until smooth and blended. 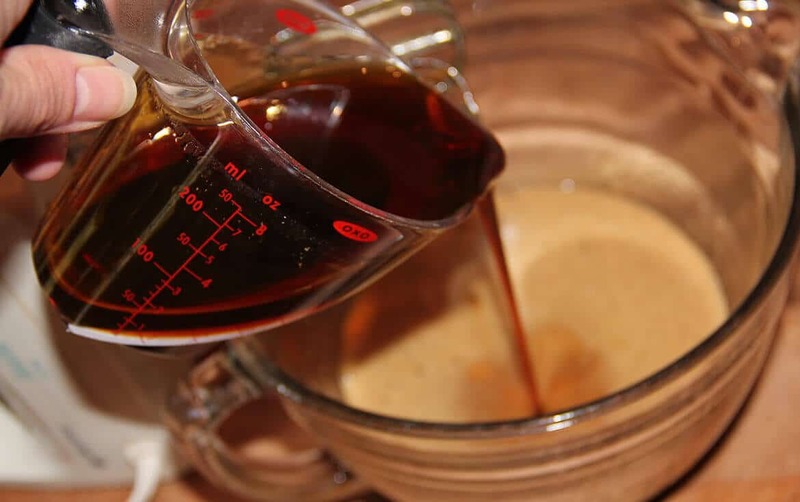 Measure 1 tablespoon molasses into measuring cup and then fill to 1/2 cup line with cane syrup. Add 1/2 cup corn syrup and then pour into egg mixture and whisk gently. Add 1 1/2 cups chopped, toasted pecans and stir to coat all pecans. Pour into pie crust. Bake for 50-55 minutes until just slightly jiggly in the center. Let pie rest on cooling rack for at least an hour before serving.